STILL AROUND: Nanga Medamit Bazaar built in the 1950’s. THE riverbanks are fairly clean but the water is brownish as a few longboat operators ferry people to the government jetty at Nanga Medamit. Nanga Medamit is a small outpost where time seems to stand still. The wooden bazaar, built by the colonial government, across the river is still around. Young people from the area leaving to study in Kuching and Kuala Lumpur will be making their way to Limbang Airport, 40 km away, by chartered van driven by a local resident called Empaling. The Medamit-Limbang bus service does not seem to be operational. Mobile phones — with coverage network here – are used to hire private vans like Empaling’s. Help is just a phone call away but further up in the ulu, mobile phones can only work if you climb up a hill to tap into some network service. Years ago, help came through wireless radio, recalled an old man sitting near the jetty. At least, he appears quite up to date, carrying a good Nokia unit, given by his son, everwhere he goes. The Ibans from several longhouses such as Mendalam, Meruyut, Tanah Merah, Rumah Gani, Kuala Medamit and Ensungai come down by the boatloads to the Nanga Medamit jetty which has been serving as a transit point for travellers from the interior since the Brooke era. Several interesting episodes have occurred in Nanga Medamit which perhaps cannot be found in history books. These include oral historical accounts from locals like Cikgu Steven Bejit, one of the oldest Batu Lintang College trained teachers, and Penghulu Robert Kunyut, among others. According to these accounts, the Ibans were sent to the Limbang Valley by the Brooke government to develop agricultural lands. Penghulu Kunyut’s grandfather led his relatives from Skrang to the Limbang Valley, taking with them letters from the government as proof of their eligibility to settle down there. It was the most interesting of pioneering journeys — how these Ibans, with their families, including young children, managed to move up the Limbang Valley and put down roots there despite the challenging environment. Using longboats built with their own hands, they paddled up to Nanga Medamit “where they have land rich in plants and animals” and settled in this uninhabited land in the 1920’s. According to Tuai Rumah Aling, many Chinese also moved up river to live among the Ibans in Nanga Medamit where they could hide from the Japanese occupiers. The Japanese were on the lookout for those Chinese who had a role in helping the Mainland. The Ibans provided them rice and food besides safety from capture. The Japanese occupation saw a prong of Operation Semut I in the Limbang Valley. From Tom Harrison’s accounts, two men — Tuan Phil and Tuan Sandy — were involved in encouraging the locals to resist the Japanese invaders. Nanga Medamit was a fairly important outpost during this operation. According to informed sources, there were four Japanese soldiers stationed at Rumah Penghulu Ngang and five at Nanga Medamit. Tuan Phil instructed the Ibans to capture these soldiers alive. However, Tuan Sandy shot them at Nanga Medamit and the Ibans took the heads home (based on a letter written by Ramlee anak Usoh in Voices from Borneo: The Japanese War). In Dec 1962, the Brunei Rebellion broke out in Limbang. Five of the rebels decided to round up the Iban tuai rumahs to garner support for their mission. But they were surprised the Ibans could not be convinced to join the rebellion. The Iban leaders and their followers, most of whom were carrying air rifles and shotguns, had lined the banks of Medamit River. Perhaps, because the five rebels were not trained to use their machineguns or were shocked by the unity of the Ibans, they were “taken” and bound. For a few days, they were put in a wooden rice storehouse in Nanga Medamit. When a young Iban called Gawan (later rewarded and made a chieftain) and a few others like Big Belayong took the five men, shirtless and shoeless, to Limbang, they were met by British officials who later decorated Gawan for bravery. The other Ibans staying behind in Nanga Medamit only “felt good because they had served the Queen with loyalty and valour.” They did not think of doing something for the government to gain a reward. In January 1963, the biggest floods ever in the history of the Limbang Valley hit and once again, Nanga Medamit became the centre of activites. Helicopters and British military men filled the confluence station, air lifting victims and bringing food and medical supplies and other necessities to the Ibans, Bisayas, Kedayans, and Lun Bawangs. Many longhouses were flooded to the rooftops. Never had the people of the Limbang Valley seen a natural disaster of such destructive scale. Children could not go to school. One determined Iban boy was airlifted to Brunei where he continued his journey to Miri to begin his school year at Tanjong Lobang a few days late. After Malaysia was formed, Nanga Medamit became a timber concession area. The word company became a byword for the locals. Barter trading diminished and cash was king. Lorries and tugboats were symbols of wealth. Logs were floated down from the upper reaches of the Limbang River and its tributaires to Nanga Medamit. In the last few years, a gravel company has taken over the area. Where logs were once lodged, today, quarried gravels are piled up like mountains to be removed by new types of lorries — made in China and Japan — for construction activities in and around Limbang. 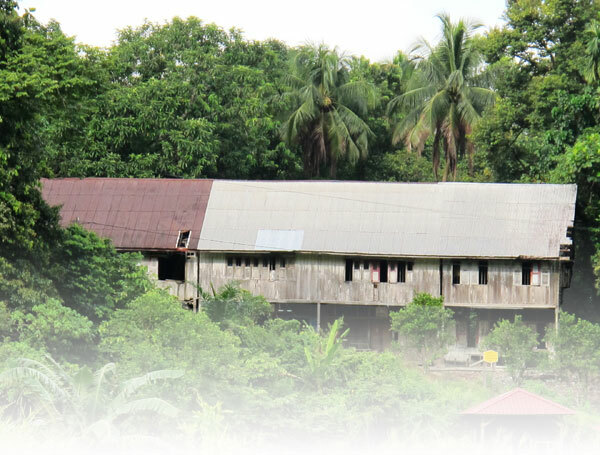 Fifty years after the initial company was set up, the people of this part of the Limbang Valley continue to embrace the significant strategic importance of Nanga Medamit. Today, the place has several modern concrete shops, a big secondary school, a few churches, a surau, a few government offices, a police station and many wooden shops on one side of the river. On the opposite side are the primary school, founded in 1956, and the bazaar. Two West Malaysian friends of the Iban boys from Mendalam visited the longhouse for Gawai. The new generation are eager to continue the next leg of their journey by air. It is as though they had arrived by time machine into the 21st century where their mobile phones started ringing while some of them started texting to the rest of the world. A group of young Iban girl students said they were looking forward to going back to college in Kuching – happy that they were able to stay a few days at their longhouse for Gawai. Transport has become easier nowadays and though using MasWings (used to be only RM45 from Limbang to Miri) costs a bit more, they are happy to travel by air anyway. However, the waterways remain an important mode of transport. River transport is convenient with the regular longboat service. 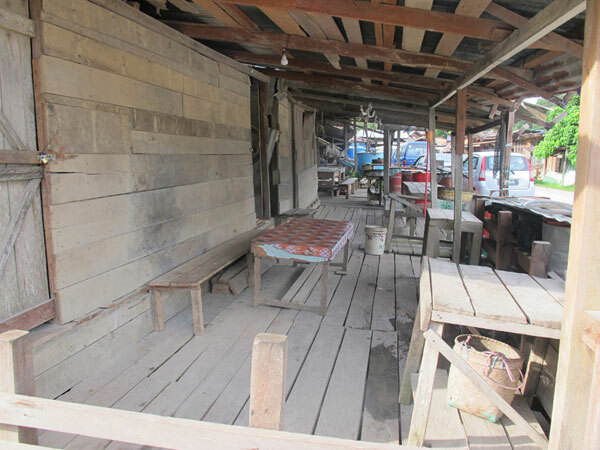 Tanah Merah is one longhouse that cannot be reached by road yet. Many of the residents park their cars at Nanga Medamit. In the evening, one can see a long line of cars parked along the road to Medamit. Some even build their car sheds near the jetty. A professional called Robert from Medamit remembers those days (before 1973) when missing a boat at Nanga Medamit meant walking all the way home to Rumah Aling in Ulu Medamit. Back then, Robert was a primary one pupil in Limbang’s St Edmund. During the school holidays, he returned home to see his mother with his uncle Ngayong Mambang, a champion swimmer. They walked all the way from Nanga Medamit, taking almost 24 hours to get to Rumah Aling. Ngayong who was in Form Two at the time, carried young Robert on his back during long walk home. Forty years on, Robert remembers the unforgettable experience with tears in his eyes. No one ever imagined a town boy in primary one could have made a journey home through the jungles in this manner. The younger generation are keen to move into the era of modern technology — and even further afield to seek better opportunities and prospects. Longhouse headmen have also become more progressive and enthusiastic about education. Cikgu Bejit’s own daughter, Cikgu Saloma is teaching in West Malaysia and many of the Ibans from here are working in Egypt, Australia and Papua New Guinea, Nigeria, the Congo and Singapore in many different professional fields. Ga, the boatman, is waiting to ferry passengers across the river while Empaling is anxious to hit the road. Time, as a commodity, is precious. Not a minute to lose because the plane has to take off and the road journey by van may not be that smooth. Will Nanga Medamit see a more rapid development soon? AS IT IS: The front portion of a wooden shop. 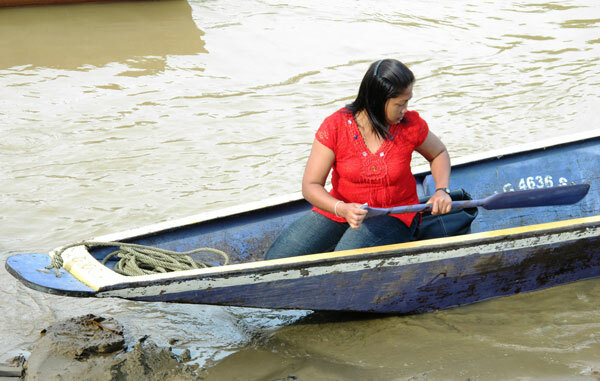 TOUGH JOB: Boatwoman of Medamit-Limbang Rivers.